This article is about a New Jersey light rail system. For the Norwegian light rail system, see Bergen Light Rail. Passing trains near Exchange Place. The Hudson–Bergen Light Rail (HBLR) is a light rail system in Hudson County, New Jersey, United States. Owned by New Jersey Transit (NJT) and operated by the 21st Century Rail Corporation, it connects the communities of Bayonne, Jersey City, Hoboken, Weehawken, Union City (at the city line with West New York), and North Bergen. The system began operating its first segment in April 2000, expanded in phases during the next decade, and was completed with the opening of its southern terminus on January 31, 2011. The line generally runs parallel to the Hudson River and Upper New York Bay, while its northern end and its western branch travel through the lower Hudson Palisades. HBLR has twenty-four stations along a total track length of just over 34 miles (55 km) and serves over 54,000 weekday passengers. There are plans for expansion through extensions and additional stations. The project was financed by a mixture of state and federal funding. With an eventual overall cost of approximately $2.2 billion to complete its initial operating segments, the Hudson–Bergen Light Rail was one of the largest public works projects ever in New Jersey. The system is a component of the state's smart growth strategy to reduce auto-ridership and to revitalize older urban and suburban areas through transit-oriented development. Hudson County, New Jersey, is the sixth most densely populated county in the U.S. and has one of America's highest percentages of public transportation use. During the 1980s and early 1990s, planners and government officials realized that alternative transportation systems needed to be put in place to relieve increasing congestion along the Hudson Waterfront, particularly in the vicinity of the Hudson River crossings. After extensive studies, it was decided that the most efficient and cost-effective system to meet the growing demands of the area would be a light rail system, constructed in several phases. The design, construction, operation, and maintenance of the system is part of a public–private partnership. In 1996, New Jersey Transit awarded a "DBOM" (design/build/operate/maintain) contract to the 21st Century Rail Corporation, a subsidiary of Washington Group International, an engineering and construction consulting firm later acquired by URS, then AECOM. Under the contract, 21st Century Rail would deliver a fleet of vehicles, a guaranteed completion date, and 15 years of operation and maintenance of the system, for a fixed price. The agreement was later extended to a 20-year period. Original plans called for extending the Hudson–Bergen Light Rail north to the Vince Lombardi Park-and-Ride in Ridgefield, south to 5th Street in Bayonne, and west to Droyer's Point in Jersey City. In Hoboken, the line was to have originally been configured as a through-running operation, with an alignment built closer to the river which would have given closer access to both the PATH station entrance and the bus terminal. This was shelved in favor of the current stub-end station in the southern end of Hoboken Terminal and the current route along an existing right-of-way at the foot of the Hudson Palisades on the city's west side. 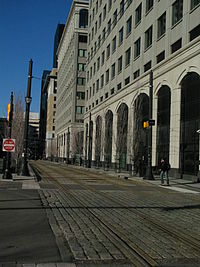 The light rail opened to the public on April 15, 2000 with an initial operating segment connecting Bayonne 34th Street and Exchange Place, as well as the spur line to West Side Avenue. Later that year, on November 18, the service was extended northward to Pavonia-Newport. On September 29, 2002, service was extended to Hoboken Terminal, which completed MOS-1, the first Minimum Operating Segment (MOS) of the project, at the cost of $992 million. MOS-2 involved several extensions costing a combined $1.2 billion. The first extension as part of MOS-2, which brough the light rail system southward to 22nd Street in Bayonne, was opened on November 15, 2003. It also involved extending the line west and north of Hoboken Terminal into Weehawken. The line was completed to Lincoln Harbor on September 7, 2004, and to Port Imperial on weekends only on October 29, 2005. The line was extended from Port Imperial to Tonnelle Avenue in North Bergen on February 25, 2006, and light rail vehicles began running seven days a week to Tonnelle Avenue. Bus service on connecting routes was modified so that there would be more direct connections to Hudson–Bergen Light Rail stations. The extension to southern terminal at 8th Street opened January 31, 2011, at a cost of $100 million. In early 2019, it was announced that service on the West Side Branch would be suspended for nine months starting in June 2019 to allow for repairs to a sewer line running along the right-of-way and that service instead would be provided by NJ Transit shuttle buses. Bayonne Flyer express service operates on the 8th Street–Hoboken route in the during weekday peak hours, stopping at all Bayonne stations, Liberty State Park, Essex Street, Exchange Place, Harborside Financial Center, Pavonia-Newport, and Hoboken Terminal. Park-and-Ride lots are available at East 22nd Street, East 34th Street, West Side Avenue, Liberty State Park and Tonnelle Avenue. In total, there are 3,880 parking spaces. Paid transfer to the Port Authority Trans-Hudson (PATH) is possible at Exchange Place, Pavonia-Newport and Hoboken Terminal, where connections to NJT commuter rail service are also available. Paid transfer to New York Waterway ferries is also available at some stations. NJT and other buses serve most stations. Many of the stations feature public art. A total of 30 artists have created 50 art works with various themes for the stations. For example, the Liberty State Park station features glass tiles representing a number of "fallen flag" railroad logos. NOTE: Those buses which do not originate at the station travel along Bergenline Avenue or Kennedy Boulevard. Southbound buses and all #23 buses pull into the station. Northbound buses via River Road stop on Port Imperial Boulevard. Buses stop one block north on Grand Street. NOTE: #81 and the Bergen Avenue bus stop one block west on Bergen Avenue. The #4 and the NJT #6 stop on Ocean Avenue, one block east. Buses stop one block west on Mallory Avenue. Buses stop two blocks west on Broadway. NOTE: The Broadway Bus stops one block west on Broadway. Buses stop one block east on Broadway and two blocks north. Like most other light rail services in the United States, the HBLR operates on a proof-of-payment system, in which riders must present their tickets upon request during random fare inspections. Passengers must purchase tickets at NJ Transit ticket vending machines (TVMs) on or near station platforms. One-way, round-trip, and ten-trip tickets must then be validated at automated validators located near the TVMs, which date and time stamp the ticket for 60 minutes of use. NJ Transit's fare inspectors randomly check tickets on trains and at stations; as of 2014, the fine for fare evasion is $100. As of September 28, 2016, a one-way adult fare is $2.25. Ten-trip tickets are $22.50. A monthly, unlimited pass is $70; holders of monthly passes can transfer to NJ Transit buses without an additional fare. Senior citizens (62 and older; valid ID may be requested), passengers with disabilities, and children under 12 may travel on the light rail at a reduced fare of $1.05. Customers who purchase one-way tickets can purchase "tickets with transfer" at a cost of $3.00. When validated, these tickets may be used for travel on the light rail system, plus a one-zone transfer to any connecting NJ Transit intrastate bus. Conversely, transfers purchased on intrastate buses are accepted on the HBLR. Valid NJ Transit weekly and monthly rail passes, as well as 2-zone or greater bus passes, are also good for travel and do not need validation. In May 2012, NJ Transit and NY Waterway introduced a monthly or ten-trip discounted combination fare for passengers using the HBLR and ferry at Weehawken Port Imperial. Monthly joint tickets are also available for ferry passengers using slips at Lincoln Harbor and 14th Street (Hoboken). In February 2013, NJ Transit began offering free weekend parking at Tonnelle Avenue, Liberty State Park, West Side Avenue, 34th Street and 45th Street stations. The Hudson–Bergen Light Rail system uses a combination of old rail and new exclusive rights-of-way for most of its length, with some grade separation in certain areas. It shares a lane with automobiles on a portion of Essex Street in downtown Jersey City, but for the most part, does not operate with other traffic. At-grade crossings are equipped with transit-signal priority signals to automatically change traffic lights in favor of the light rail. A new curved viaduct was constructed eastward from 8th Street to 11th Street in Bayonne to join the existing right-of way to Liberty State Park, which was once the main line of the Central Railroad of New Jersey (CNJ), parts of which rest on the bed of the Morris Canal; CNJ's Newark and New York Railroad right-of-way was used for the line west to West Side Avenue. From Liberty State Park to Hoboken Terminal the line uses a new right-of-way. 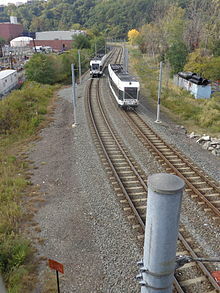 From the terminal to the curve south of 2nd Street, the line runs parallel to NJT yard and tracks, formerly the main line of the Lackawanna Railroad; north of the curve it uses what had been Conrail's River Line, and was originally the New Jersey Junction Railroad. In order to obtain the right-of-way for the line north from Hoboken, NJT paid to upgrade the Northern Running Track, allowing Conrail to shift its operations. The tunnel and cut through the Palisades were originally the West Shore Railroad's main line. The Hudson–Bergen Light Rail system has 52 electrically powered air-conditioned vehicles built by Kinki Sharyo and numbered in the 2000 series. The cars were assembled in Harrison, New Jersey. Each vehicle is 90 feet (27.43 m) long and has four sets of double-opening doors on each side, with seats for 68 passengers and standing room for another 122 passengers. The Newark Light Rail system uses the same type of vehicle, with slight modifications to the trucks and wheels due to the different rails used. On July 3, 2013, NJ Transit released lengthened light rail car 2054 as a prototype. The expanded car consists of two new sections, increasing length by 37 feet (11.28 m) to a total of 127 feet (38.71 m). Seating capacity is increased from 68 passengers to 102 passengers, with standing capacity increased accordingly as well. Overall capacity increases from approximately 200 per vehicle to 300 per vehicle. 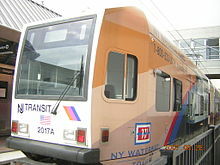 The prototype was placed on rotations through the three lines of the system over the next 6 months, after which, NJ Transit started to expand 26 cars in total, or half of the total fleet. The contract to expand the remaining balance of 25 cars was approved on July 9, 2014. The expanded cars are being renumbered to the 5000 series. In May 2011 NJT announced a plan for 0.7-mile (1.1 km) extension of the West Side Branch. The new track along the former Newark and New York Railroad ROW would be laid on an elevated viaduct from the West Side Avenue station across Route 440 to the northern end of the proposed Bayfront redevelopment area, where a new island platform station would be constructed. The trip between the two stations would take 1 minute and 50 seconds. The project, which requires the approval of the metropolitan planning organization, North Jersey Transportation Planning Authority, to be eligible for federal funding, is estimated to cost $171.6 million. The extension is part of a broader plan to transform the far West Side of Jersey City from previous industrial uses to mixed-use communities that also includes the development of the West Campus of New Jersey City University (currently under construction) and conversion of Route 440 to an urban boulevard. As of March 2017, funding for final design and engineering work was appropriated. In December 2017, NJ Transit approved a $5 million preliminary engineering contract for the extension project. The results of the Jersey City/Hoboken Connectivity Study published in June 2011 identified the target area at southwestern Hoboken, Lower Jersey City, and Jersey City Heights as a potential site for a new station. The HBLR runs at the foot the Hudson Palisades under NJT's Hoboken Terminal lines with the 2nd Street station north of the ROW. The district is characterized as having an irregular street grid (including colonial-era Paterson Plank Road and Newark Plank Road), being heavily congested (often with Holland Tunnel-bound traffic) and undergoing transition to a residential/commercial uses In September 2012, a walkway/bike path was completed near the station, providing better pedestrian access to it. It was announced in October 2012 that NJT had received a $400,000 grant to study the possibility of building a new station at 18th Street in Jersey City, just south of the municipal border and NJT commuter rail ROW. According to The New York Times, NJT approved plans in June 2013 for a new light rail station in northwestern Hoboken, near property owned by the Rockefeller Group, which wants to build a 40-story office tower in that area near the city's northern border with Weehawken. This agreement was not made known to the local government. but came to light after Mayor of Hoboken Dawn Zimmer, appearing on MSNBC on January 18, 2014, claimed that Lt Governor Kim Guadagno and Richard Constable, director of the New Jersey Department of Community Affairs, had earlier insinuated to her that more Sandy relief funds would be released to the city if it approved the project proposed by Rockefeller. The agreement is dated June 21, 2014. The plans show a station at 17th Street and Clinton Street. Despite its name, the Hudson–Bergen Light Rail only serves Hudson County. 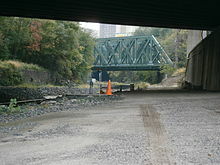 The Northern Branch is a proposed extension from the current northern terminus at Tonnelle Avenue using the right of way of the former Erie Northern Branch into eastern Bergen County with a new terminus at the Englewood Hospital and Medical Center. Stops would be added at 91st Street in North Bergen, Fairview, Ridgefield, Palisades Park, Leonia, and Englewood, with stops in the later at New Jersey Route 4 and Englewood Town Center. An earlier proposal to use diesel multiple unit (DMU) vehicles was later abandoned in favor of the electrically operated system used by HBLR as were proposals to extend the line into Tenafly. The estimated cost of the project is $800–$900 million, though funding has not been secured. An initial $40 million has been allocated for design, engineering and environmental studies. The project requires approval of an environmental impact statement and Federal Transit Administration approval. Funding for completion if the environmental study, expected to take two years, was approved by NJ Transit in May 2013. After being stalled as of May 2017 funding for the project may be in the pipeline. The two branches of the HBLR system create the northern and eastern borders of Canal Crossing, a planned New Urbanist community in Jersey City. A new station at Caven Point Avenue is proposed on the Bayonne line along its eastern perimeter between current stations at Richard Street and Liberty State Park. There have been discussions to extend the system westward to either or both Secaucus Junction, a major interchange station of New Jersey Transit rail operations, and to the Meadowlands Sports Complex (MSC). Possible routes include one from Downtown Jersey City, via the Harsimus Stem Embankment and Bergen Arches, or an extension of the line from Tonnelle Avenue. Several studies have been conducted to determine the best future use of the Bergen Arches, the former Erie Railroad cut through Bergen Hill in Jersey City. A freeway proposed in 1989 by Governor Thomas Kean was strongly supported by then-Mayor Bret Schundler. In 1998, this project was allocated $26 million in the federal Transportation Equity Act for the 21st Century. During the 2001 mayoral race candidates instead lobbied for a mass transit line, and in 2002 the plans were dropped during Mayor Cunningham's administration. In that year, Parsons Brinkerhoff, a consulting firm, released another report commission by the New Jersey Department of Transportation (NJDOT) describing the conditions and analysis of various options. NJDOT has continued to fund studies for the project. In March 2011, an additional $13.4 million was allocated to advance the project. 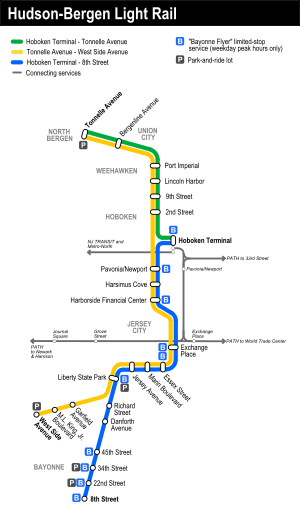 In the first decade of the 21st century, studies sponsored by the New Jersey Sports and Exposition Authority were conducted to address mass transit options to the MSC, including the possible extension of HBLR from its northern terminus through Secaucus and across the Hackensack River. At the time it was estimated that the extension would cost $1 billion. When it was decided to build a rail spur in 2004, state officials said that an HBLR extension was not ruled out as a future possibility. The Meadowlands Rail Line was eventually opened in 2009. The Bayonne Bridge connects Bayonne and Staten Island, a borough of New York City. The bridge was originally built to accommodate two extra lanes that could be used for light rail service. In the 2010s the Port Authority of New York and New Jersey raised the roadbed of the bridge by 64 feet (20 m), in order to provide the 215-foot (66 m) clearance required by the newer post-panamax container ships to pass under it. Final plans for the reconstructed bridge eventually did not include a rail element. In September 2007, the S89 limited-stop bus service was introduced between Richmond Avenue in Staten Island and the 34th Street HBLR station. As of February 2018[update], it runs only during the weekday peak period. While not having begun any studies, New Jersey Transit investigated the feasibility of extending HBLR from the 8th Street Station across the raised bridge. An academic study has been produced in the Journal of Public Transportation. Completing any such extension would involve a collaboration between NJ Transit, New York State, and New York City. The development of a Staten Island light rail system which could connect with the HBLR system gained political support in New York. US Senator Robert Menendez supported the HBLR extension conceptually, but questioned the benefit for New Jersey. The Metropolitan Transportation Authority's 2015–2019 Capital Plan was amended in May 2017 to allocate $4 million to study the potential extension. There is no longer a shuttlebus from the Liberty State Park Station to the waterfront Central Railroad of New Jersey Terminal in Liberty State Park, which makes for a relatively long walk to access the Central Railroad terminal via mass transit. There are proposals to build a trolley line to the Central Railroad terminal building and other points in the park from the Liberty State Park Station light rail station to improve access. The Liberty Historic Railway organization is also attempting to jump start the construction of this trolley line. The light rail has been a catalyst for both residential and commercial development along the route and has played a significant role in the revitalization of Hudson County. Many of the stops are sited in vacant or underutilized areas, which are now beginning to see intense residential and mixed-use development. The line running along Essex Street in downtown Jersey City has spawned 3,000 residential units in five years. An 86-acre (350,000 m2) tract of land bordering Liberty State Park is being redeveloped into a transit-oriented development known as Liberty Harbor North, which will consist of 6,000 residential units and millions of square feet of commercial space. Two New Urbanism projects in Jersey City, Bayfront and Canal Crossing, are being planned with the expectation that new stations will be built in conjunction with their development. Other developments are either planned or already underway in Hoboken, Union City, Bayonne, and Weehawken, in areas very near to light rail stations. ^ a b c "NJ Transit Facts At a Glance Fiscal Year 2014" (pdf). NJ Transit. March 2015. Retrieved April 2, 2015. ^ a b c "Project Complete" (Press release). New Jersey Transit. May 2006. Retrieved May 15, 2011. ^ "United States -- County by State, and for Puerto Rico GCT-PH1. Population, Housing Units, Area, and Density: 2000". American Fact Finder. United States Census Bureau. Retrieved May 18, 2011. ^ Targetting Transit:Assessing Transit Opportunities Around New Jersey's Transit Stations (PDF) (Report). New Jersey Future. September 2012. Retrieved October 10, 2012. ^ a b Kerr, Peter (June 27, 1989). "Kean Proposes Transit Plan For Waterfront". The New York Times. Retrieved September 1, 2009. ^ a b "Hudson-Bergen Light Rail System, USA". Railway Technology.com. Retrieved May 15, 2011. ^ "Hudson-Bergen Light Rail". URS. Archived from the original on March 20, 2012. Retrieved May 17, 2011. ^ Hudson-Bergen Light Rail moves further into Bayonne's Business District New Jersey Department of Transportation Press release November 6, 2003. ^ Hudson-Bergen Light Rail Opens in Weehawken - 2 new stations open in Hoboken New Jersey Transit Press Release September 7, 2004. ^ Hudson-Bergen Light Rail Arriving at Weehawken's Port Imperial Station New Jersey Transit Press release October 24, 2005. 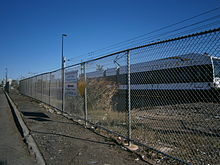 ^ "New Jersey: Newark: 2 New Rail Stations To Open", The New York Times, February 3, 2006. ^ New Light Rail Stations open in Union City and North Bergen New Jersey Transit Press Release, February 25, 2006. ^ "8th Street Extension" (Press release). New Jersey Transit. October 15, 2008. Retrieved May 15, 2011. ^ "8th Street Extension" (Press release). New Jersey Transit. January 31, 2011. Retrieved May 15, 2011. ^ McDonald, Terrence T. (March 7, 2019). "Light rail riders sound off on planned route suspension in Jersey City". nj.com. Retrieved March 8, 2019. 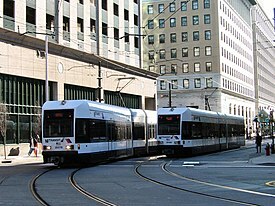 ^ "West Side Avenue Light Rail Service to be Suspended Until 2020". Jersey Digs. February 8, 2019. Retrieved March 8, 2019. ^ "They've Been Working on the Railroad (Cars)", The New York Times, February 28, 1999. Accessed November 20, 2007. "There will one operator aboard each car, and fares will be under a proof of purchase system, a kind of honor system where a rider will be required to show a ticket if asked." ^ Brenzel, Kathryn (November 6, 2014). "NJ Transit's Light Rail ticketing system may tempt riders to cheat". The Jersey Journal. Retrieved November 6, 2014. ^ Hudson-Bergen Light Rail (as of 1/31/11), New Jersey Transit. Accessed June 29, 2011. ^ Frassinelli, Mike (May 31, 2012). "NJ Transit, NY Waterway collaborate for cheaper 'Surf and Turf' pass". The Star-Ledger. Retrieved October 1, 2013. ^ "NJ Transit Joint Ticket". NY Waterway. Retrieved October 1, 2013. ^ "Light Rail Tickets". New Jersey Transit. Retrieved January 1, 2013. ^ "NJ TRANSIT OFFERS FREE HUDSON-BERGEN LIGHT RAIL PARKING ON SATURDAYS AND SUNDAYS Five locations to offer free Sat./Sun. parking starting February 16" (Press release). NJT. February 13, 2013. Retrieved July 12, 2013. ^ Fazio, A.E. (Widener University); T.R. Parsons Brinckerhof. Operations and Communications Designing New Light Rail Taking Engineering Beyond Vanilla (PDF) (Report). Transportation Research Circular E-C058: 9th National Light Rail Transit Conference. Retrieved May 5, 2011. ^ New Jersey Transit. Njtransit.com (July 3, 2013). Retrieved on June 23, 2014. ^ NJ Transit unveils expanded Hudson-Bergen Light Rail vehicle. NJ.com (July 3, 2013). Retrieved on June 23, 2014. ^ Douglas John Bowen. "NJT OKs LRV add-ons - Railway Age". railwayage.com. ^ Whiten, John (May 11, 2011). "Light Rail Extension to Jersey City's West Side Gets Push Forward from NJ Transit". Jersey City Independent. Retrieved May 13, 2011. ^ NJT newsletter 09/16/2009 "NJ Transit Approves Study of Light Rail Extension" Check |url= value (help) (Press release). New Jersey Transit. September 16, 2010. Retrieved April 30, 2011. ^ Whiten, Jon (August 23, 2010). "West Side Light Rail Extension Project Picks Up Some Federal Funding". Jersey City Independent. Retrieved April 4, 2011. ^ "Rail News - NJ Transit's board advances light-rail extension, awards transit center contract. For Railroad Career Professionals". Progressive Railroading. ^ "440 Fact Sheet" (pdf). New Jersey Transit. February 2010. Retrieved May 15, 2011. ^ "NJ Transit Advances Light Rail Extension Project" (Press release). New Jersey Transit. May 11, 2011. Retrieved May 15, 2011. ^ MacDonald, Terrence (May 14, 2011). "Jersey City is "thankful" for NJ Transit giving thumbs up to plan for extending Light Rail across Route 440 to serve proposed Bayfront development and New Jersey City University's planned western campus". The Jersey Journal. Retrieved May 15, 2011. ^ "Groundbreaking at University Place Redevelopment Project". NJCU. September 18, 2017. Retrieved January 12, 2018. ^ a b Jacobs (March 9, 2010). Route 440/Routes 1&9 Multi-Use Urban Boulevard and Through Truck Diversion Concept Development Study (PDF) (Report). Jersey City Department of Housing, Economic Development and Commerce. ^ Scope of Work (pdf) (Report). www.440study.com. ^ MacDonald, Terrence (March 25, 2011). "Wittpenn Bridge and Pulaski Skyway among Hudson County road projects to receive $551 million in state funding". The Jersey Journal. ^ "HBLR Route 440 Extension Alternatives Analysis". New Jersey Transit. Archived from the original on March 22, 2012. Retrieved May 5, 2011. ^ "FY17 Supplemental Appropriation List" (PDF). NJ Transit. March 27, 2017. Retrieved April 16, 2017. ^ "Expansion of Hudson-Bergen light rail expected to get $5 million boost". The Jersey Journal. December 9, 2017. Retrieved January 12, 2018. ^ Eng-Wong, Taub and Associates (June 2011). Jersey City/Hoboken Connectivity Study Final Report (Report). Hudson County/NJTPA. Archived from the original on 2012-01-30. Retrieved November 1, 2012. ^ One year late, $4M walkway linking Hoboken and Jersey City nearing completion. NJ.com. Retrieved on June 23, 2014. ^ Hortillosa, Dawn (September 21, 2012). "Walkway Linking Second Street Light Rail to JC Heights Nearing Completion, as Pipeline Delays Nearby Park's Construction". Jersey City Independent. Retrieved November 1, 2012. ^ "Hudson-Bergen Light Rail - 2nd Street Station Walkway". Hall General Contractors. Retrieved November 1, 2012. ^ "Hudson Bergen Light Rail 2nd Street Station Esplanade". NJT. Retrieved November 1, 2012. ^ Hortillosa, Dawn (October 26, 2012). "NJ Transit Studying Possibility of Another Light Rail Stop in JC, Other HBLR Improvements". Jersey City Independent. Retrieved November 1, 2012. ^ McGheenan, Patrick; Balijan, Charles V. (January 29, 2014). "How Pressure Mounted for Development in Hoboken". The New York Times. Retrieved February 25, 2014. ^ "NJ Transit approved nonbinding agreement for light rail station in northern Hoboken last year". Hudson Reporter. January 30, 2014. Retrieved February 25, 2014. ^ Brenzel, Kathryn (February 4, 2014). "Rockefeller Group, NJ Transit agreed to build new light rail station but left Hoboken mayor in the dark, report says". The Jersey Journal. Retrieved February 25, 2014. ^ Kornacki, Steve (January 18, 2014). "Christie camp held Sandy relief money hostage, mayor alleges". MSNBC. Retrieved February 14, 2014. ^ Freidman, Matt (January 18, 2014). "Hoboken mayor claims Christie administration held city's Sandy recovery funds 'hostage' to help developer". The Star-Ledger. Retrieved February 14, 2014. ^ Giambusso, David; Baxter, Chris (January 18, 2014). "Hoboken Mayor Dawn Zimmer alleges Chris Christie's office withheld Sandy aid over development deal". The Star-Ledger. Retrieved February 14, 2014. ^ Brenzel, Kathryn (February 13, 2014). "Report: NJ Transit and law firm linked to Christie secretly agreed to build light rail station in Hoboken". NJ.com. Retrieved February 26, 2014. ^ Brenzel, Kathryn (February 20, 2014). "Stand clear of the closing doors: NJ Transit still silent on secret Hoboken light rail deal". NJ.com. Retrieved February 26, 2014. ^ "Non-binding MOU for a Potential New Light Rail Station in Hoboken's North End" (PDF). June 21, 2014. Retrieved February 25, 2014. ^ Brenzel, Kathryn (February 26, 2014). "NJ Transit releases missing details from secret Hoboken light rail agreement". NJ.com. Retrieved February 26, 2014. ^ a b Rouse, Karen (May 1, 2013). "NJ Transit scraps light rail proposal in Tenafly for potential new alternative". The Record. Retrieved May 3, 2013. ^ North Jersey.com Archived July 21, 2009, at the Wayback Machine Accessed July 19, 2009. ^ "Now Arriving:Passenger Rail for Bergen County" (Press release). New Jersey Transit. July 19, 2009. Retrieved May 15, 2011. ^ Rouse, Karen (July 19, 2009). "Going with electric trains". The Record. Archived from the original on July 21, 2009. Retrieved July 19, 2009. ^ Davis, Tom (May 7, 2010). "Light Rail Line to Use Electric Cars". The Record. p. L1. Archived from the original on May 11, 2010. Retrieved May 22, 2010. ^ "NJ Transit advances light rail extension to Bergen County". nj.com. May 9, 2013. Retrieved May 10, 2013. ^ "Proposed Draft Canal Crossing Redevelopment Plan". Jersey City Redevelopment Agency. August 25, 2008. Retrieved April 3, 2011. ^ "Canal Crossing". www.jerseycitynj.gov. Retrieved April 3, 2011. ^ "Annual Report 2008–2009" (PDF). Association of Rail Passengers. November 19, 2009. Archived from the original (PDF) on January 1, 2011. Retrieved May 19, 2011. ^ Bergen Arches Through Jersey City Palisades (PDF). Statewide Transportation Improvement Program (Report). NJDOT/NJT. pp. Section II/6. Retrieved May 17, 2011. ^ Sullivan, Tom (May 13, 2011). "Governor should look into train to nowhere". The Record. Bergen County. Archived from the original on September 30, 2012. Retrieved July 21, 2011. ^ "JERSEY PORTS:Newark-Jersey City projects". TollRoadsNews. July 4, 1998. Archived from the original on July 6, 2008. Retrieved September 1, 2009. ^ DiMaria, Paul (December 1, 1998). "Bergen Arches". Regional Transportation Advocate. Retrieved May 18, 2011. ^ HART - Hudson Alliance for Rational Transportation. Oocities.org. Retrieved on June 23, 2014. ^ "New Jersey City Mayor Could End Bergen Arches Highway Plan". Tri-State Transportation Campaign. May 28, 2001. Archived from the original on January 7, 2009. Retrieved September 1, 2009. ^ "Bergen Arches Concept Study Complete: Public Adamantly Opposes Roadway Option". Tri-State Transportation Campaign. October 28, 2002. Archived from the original on December 3, 2013. Retrieved September 1, 2009. ^ "Bergen Arches Study Overview". NJDOT. February 1, 2005. Retrieved May 18, 2011. ^ "Response to Comments Preliminary Environmental Impact Statement Meadowlands Railroad and Roadway Improvement Project" (PDF). Meadowlands Road and Railway Improvement Project Final Environmental Impact Statement. New Jersey Sports and Exposition Authority. August 2005. Archived from the original (PDF) on July 24, 2011. Retrieved May 17, 2011. ^ "N.J. officials launch rail service to Meadowlands". Associated Press. July 20, 2009. Retrieved October 9, 2009. ^ * Zeitlinger, Ron (January 4, 2012). "2 public meetings scheduled on plan to raise Bayonne Bridge". The Jersey Journal. Article including animation explanation reconstruction. ^ MTA Regional Bus Operations. "S89 bus schedule" (PDF). ^ "Hudson-Bergen Light Rail may be extended over Bayonne Bridge to Staten Island". NJ.com. ^ Cutting it close: Bayonne Bridge's height is trouble for ships and a costly question for the Port Authority Wired New York, May 19, 2006. ^ "Staten Island North Shore and West Shore Light Rails". www.plannyc.org. Archived from the original on July 20, 2011. Retrieved May 15, 2011. ^ Wrobleski, Tom (January 13, 2011). "Staten Island congressman wants Port Authority to build light rail link across Bayonne Bridge". Staten Island Advance. Retrieved May 15, 2011. ^ "A Light Rail Extension for Staten Island?". The Transport Politic. January 17, 2011. Retrieved May 15, 2011. ^ McDonald, Terrance T. (January 27, 2011). "Menendez likes idea of HBLR extension into Staten Island but wants specifics". The Jersey Journal. Retrieved July 20, 2011. ^ Shapiro, Rachel (May 27, 2017). "MTA commits $4M for West Shore light rail study". Staten Island Advance. Retrieved May 31, 2017. ^ "Liberty Historic Railway". Liberty Historic Railway Inc. February 26, 2014. Retrieved August 10, 2014. ^ Liberty Harbor North, accessed January 3, 2007. "On track to reborn cityscape: The Hudson-Bergen Light Rail line proves a boon for older urban areas" by Steve Chambers, Newark Star-Ledger, October 30, 2005. "Xanadu rail plan could be boon for N.J. official" by Shannon D. Harrington, The Record (Bergen County), May 6, 2005. "Light-rail link might cost $1B; Study for Meadowlands extension OK'd" by John Brennan, The Record (Bergen County), April 28, 2005. "Light rail to Tenafly is still a dream; NJ Transit says more study needed" by Soni Sangha, The Record (Bergen County), January 23, 2005. Wikimedia Commons has media related to Hudson-Bergen Light Rail. This page was last edited on 15 March 2019, at 18:54 (UTC).